Awesome! I just read the Engadget article and viewed the photo gallery. Absolutely beautiful, and so incredibly complicated it knocks my socks off. Which charity will be helped by the auction? AMAZING! How is it thinner then the actual PS3!? I also noticed it says “CANS” and not “PHONES” lol why? So anyway how much is someone forkin’ out for this baby $5000 or more? OMG ITS HERE IS FINALLY HERE THE PS3p WOOOOO! I couldn’t figure out why the site was taking so long. So while I was waiting I went over to Engadget and saw the culprit staring back at me. I absolutely love it! Your laptops are looking cleaner and cleaner with each execution. Keep up the good work. What are you doing with the old case? Awesome, can’t wait for the making of article, maybe I can figure out how to do the sound on mine from how you did yours. Great design, though my design is more or less the polar opposite of that. Dude…I swear you’re the modding Jesus. I’d buy your modded ps3 over the original anytime. Beautiful. Just stunningly beautiful. Love the shiny metal touch. hey does the wifi connection still work? or even the internet? Amazing. Another very nice conversion of console to laptop. Never ceases to amaze me that it can be done, this one even looks more interesting and less clunky than it’s original case. Having a hi-def screen on it is really cool. Wait so you aren’t going to make any more? Even if someone were to pay you for all the expenses and such? Bummer :(. 16 lbs… I guess that’s why it’s a portable, rather than a laptop! Another piece of stunning work. I am in awe, as I always am when I read your blog. Nary a web server can handle you, sir! man, that is soooo awesome…just like what a father of two little girls like me needs…does it have hdmi outputs to a tv? Man that is awesome. I would seriously buy that. Congratulations, that is just too cool…. Any way of plugging it into an external screen? Any worries about heat dissipation? Woah! If Ben would build a factory with workers who can make these laptops stuff, almost everyone would love to buy one. But I don’t get the weight of the PS3p. Sounds like the LCD screen is gaining the weight. You might as well get it changed. Wow, this year is GOOD for sony. With that happening and all, I guess my PS2 will be getting replaced by a PS3, not 360. New portable coming this week! Ben Heckendorn: The oooonly way to DOS a server! 😀 Nice lappy! Pingback: PlayStation 3- Portátil! « Tuum! I want to buy it! where are they sold? also, TELL ME WHERE TO GET THE 360 LAPTOP! could you still partition it and put linux on? how you do it? a;lready have the case off mine and am plucking u8p the courage to start flattening out a few capacitors a few pointers would be lots of help! is it watercoooled like the 360 one? im sure an informed build from csratch could provide some weight savings maybe cos id take it everywhere with me and youd have to put wheels on it after a bit. 16 pound scary monster. and was there anything radically different from the xbox method? amazing, what would be most interesting would be to see what it would be like if you were to use the smallest laptop specific components where substitutes would be compatible such as the wifi module if the controller systems would allow it. if sony havent consulted let alone employed you yet they are mugs – waht do you reckon you could get it to weigh and wht would its dimensions be if you had factory support and project specific component manufacture? 12 pounds? 10? 8???????? go on tell us cos i dont want to have to build one i want to get mine from argos. are you listening mr head of development at sony??????????? Hey Ben whats up? I’m a big fan of your ps3 laptop!! I saw your video on youtube and wanted to know more about the laptop like if your selling it or not because if you were I would be more than happy to buy it so if you could e-mail me back I would more than love to talk to the creater of the famous Playstation 3 portable so I really hope I can talk to you !!!!!! Stunning! I was just commenting to a friend of mine how there is not the selection of portable screens like there used to be with ps2. I am in the military and travel a lot, so as soon as I have free time I’m making my own. Keep up the good work. DAMN! You’re a genius. I saw the PS3p video on Engadget and it left me shocked, and even though I hate you for throwing the X360 at the beginning of the video (I own an X360), this PS3 IS AWESOME. Great job, and I hope one day you can make and X360p too! hehehe… See ya! i am a fan of playstation. way to go ben…nice job !! oh yer, by the way, how much would we have to pay you for you to make us one of these? $5000? $100,000? how can i possible have you make one for me. serious!!! please email me and let me know!!!!! If only Sony would take this idea and throw some money at it!!! I travel so much with my laptop anyway. I would purchase one to replace my HP in a heartbeat. I bet there is a huge market for this. Come on Sony or Microsoft!!! Open your friggin eyes!!!! Cool! Is this called ps3 notebook? I saw some sold on ebay few months ago. I have found quite a good site for PS360 controllers and playstation 3 offers take a look. I would like to know if your still making any more ps3 portables if you are I would like to know how much for one? Wow. I admire your work but im a xbox guy. I mean, who waste their money on a PS3? Would you please let the public know when part 2 of how to make your ps3 will be arriving. You have to get with Sony so this babe can hit the market, I want one. There are only two things I can think of that would make it better. 1st- If it wasnt so heavy, but hey I will live with it. 2nd- If it had an internal battery. If you cant get sony to market this you should publish your instructions for it. thats all the questions i have. and it looks very very very very very very high tech and very very very very very very very AWESOME!!!!!!!!!!!!! id buy one off you just give me a price. i live iin australia N.S.W. hey, why you don’t make more of this videogame and how much you would sell it? only ONE ps3 portable isn’t cool! I don’t understand the point of this at all. Someone Please explain it to me. I bought a laptop to play games with over a ps3 or Xbox, for many reasons.. cheaper games, more games, mods, better resolution.. Plus it can do everything a desktop pc can do. Cost me 350 bucks new. It plays Crysis, Borderlands, Fallout 3 and most games below 2009 on medium settings. Plus it’s portable. 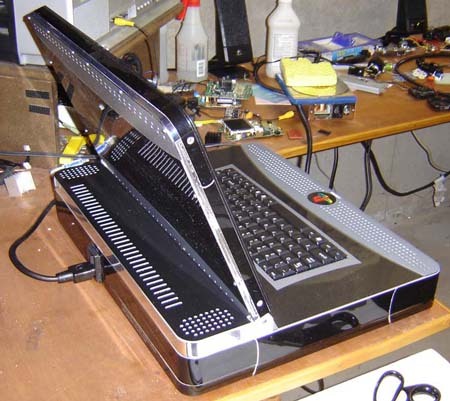 I heard someone made one of these laptop ps3 for 8000 bucks. I thought Sucker ! He could have had a serious gaming laptop for under 1000. Someone please tell me the point to this ps3 laptop because I just don’t get it. In the above comment I meant Sold.. someone made one of these and someone else bought it from him for 8000 dollars. Dude I can’t believe he can just give ALL OF THE MONEY AWAY. I’m saying sure giving 2 charity is good and all, but ALL OF IT!!! You must’ve made some serious green. You know that you don’t give ALL away. God says give like 15% of 2 charity. Don’t believe me check the bible and find out!